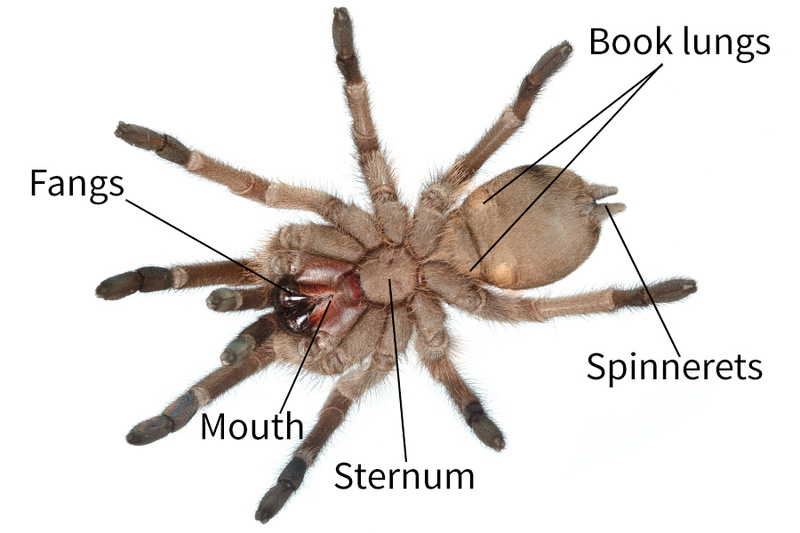 The front half of a spider's body which is the combined head and thorax. The hind body part, containing the internal organs and has the ability to expand and contract in accordance with the condition of the spider. The pair of moveable appendages in front of the mouth of spiders which include the fangs. Spiders have a pair of pedipalps which perform sensory roles, can manipulate their food and are used by the males in mating. The organs on the tip of a spider's abdomen that manipulate silk as it exits the silk glands to enable the spider to use it in various ways. Spiders have eight walking legs, each leg has seven jointed segments. Spiders with long pedipalps (such as tarantulas) sometimes appear as though they have ten legs, however this is not the case. There are around 4000 species of spiders in Australia and the diversity of species is truly incredible. They range from large, stocky burrowers, to petite, colourful web-builders, to everything in between. While all have the basic features listed above, it is not always easy to see or distinguish them. These two images represent each of the two major groups (infraorders) of spiders in Australia; the “primitive” Mygalomorphae and the “modern” Araneomorphae. The Mygalomorphs are often called primitive spiders as they have retained many of the features possessed by their relatives very early in the fossil record. They have large downward-striking fangs which are roughly parallel to one another and held beneath the spider when not in use. They have four book lungs, named after their resemblance to the pages of a book. These book lungs allow air to enter and circulate around thin plates which are richly supplied with hemolymph (blood). Mygalomorph spiders have long, finger-like spinnerets, which are frequently easy to see from above. Their eyes are quite small and often clustered together. Most are burrowing species which require relatively high humidity to survive. This group includes Tarantulas, Funnel-webs, Trapdoors and Mouse Spiders. Araneomorph are commonly called modern spiders because their features evolved more recently than those of the Mygalomorphs. Araneomorphs are far more diverse in appearance and behaviour than their primitive cousins and live in almost all hospitable habitats on Earth – including our houses. This group contains the species people encounter often and are most familiar with such as Orb-Weavers, Jumping Spiders, Wolf Spiders and Huntsmen. Araneomorph spiders have pincer-like fangs which pinch together or cross over. They have two book lungs and a spiracle (a small hole leading to fine breathing tubes, supplying blood directly to the hemolymph and organs). While this group contains many master web-builders, the spinnerets of these spiders are often small and difficult to see. The size and position of Araneomorph eyes vary as much as the rest of their appearance. Some have six eyes, but most have eight arranged in pairs. Some species such as the orb-weavers have tiny eyes and poor eyesight. Others such as Jumping Spiders and Wolf Spiders have some enlarged eyes and excellent vision. Simply put, spiders have eyes that suit their hunting style.